This case study of the big urban game Re:Activism examines moments where failures in the game’s design revealed how the design process itself is a set of ethical choices and actions, illustrating specific strategies for integrating more interesting choices into games. Ethics in a game is not inherent; it is enacted through rules, mechanics and play. This chapter is a “thick description” of the first time Re:Activism was played in which the losing team paradoxically had the kind of engaging experience the designers sought to create. The yellow team lost the game, but in many ways they also won. This is a story of how we came to learn some important lessons in the ethics of game design — from the “losing” team. The game in question is Re:Activism, a big urban game first played on June 7th, 2008 in the streets of New York City for the Come Out and Play Festival. Come Out and Play is an annual public event created and curated by game designers featuring games that take place in the public spaces of New York City. The events that took place during that initial three-hour play session sparked a year of reflection and insights as we, the game’s designers, tried to fully understand the implications of the yellow team’s loss. Their loss, and the experience they related, generated new questions, new games, and hundreds more hours of playtesting and prototyping. This chapter is a case study in the importance of failure as a catalyst for reflection about the pragmatics and ethics of game design. The yellow team’s failure to win also marked a failure in the game’s design. The events on that day challenged us to balance the unpredictable vectors of player experience and game/world collisions in big urban games, while still honoring our dedication to the formal structures of game design. 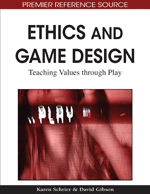 Although this chapter describes an experience specific to one instance of a game, the dialogue between players and designers presented here illuminate some interesting and broader questions about ethics, design, and play. So, who are “we”? We’re a collaborative group of students and faculty in design and the social sciences working together on the creation and study of social games in the research lab PETLab at Parsons The New School for Design. PETLab, which stands for “Prototyping, Evaluation, Teaching and Learning lab,” is a joint initiative between Parsons and Games for Change, a non-profit organization supporting the creation and appreciation of games as a medium for social change. PETLab explores and employs iterative prototyping methods to design games and interactive media, often with partnering organizations interested in using games for public interest engagement. At the time we launched Re:Activism, PETLab was still a nascent research initiative. During this time, we were developing a set of collaborative methods to tackle the creative and technological challenges of game design, as well as the question of how to best design games for change, and how social change, in the context of games, could take form.